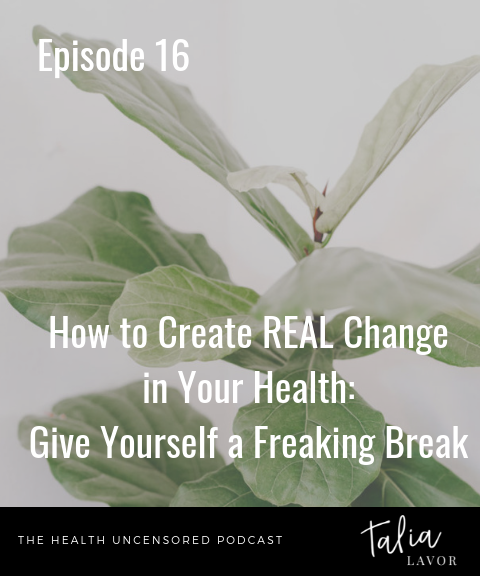 Even though I am super passionate about all of the PHYSICAL changes we make to nourish our bodies, there comes a point when we have to shift to the REAL work. I call it the REAL work, because without it, nothing else really matters. Nothing else sticks. Nothing else lasts. The REAL work is a lot of things. It’s the inner work. It’s the loving yourself instead of belittling yourself. It’s stopping the judgement and the criticism. It’s finding joy. It’s connecting with something that makes you feel better. Does that seem lazy? Does it seem like a cop out? Because I guarantee you that you will FEEL and EXPERIENCE so much more. You will GET and ACHIEVE so much more. Today we are talking about getting out of your own way, and finally GIVING YOURSELF A FREAKING BREAK.